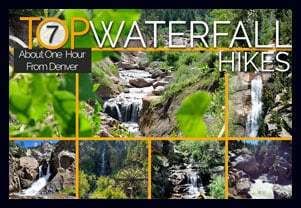 Eldorado Falls is a cascade waterfall tucked back in Walker Ranch near Boulder, Colorado. 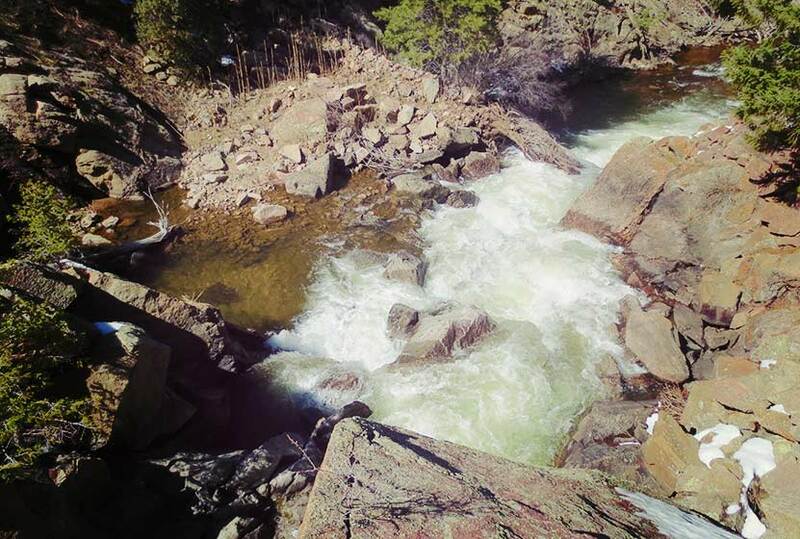 It’s an easy to moderate 1.25 mile hike from the Ethel Harrold Trailhead down to where South Boulder Creek winds through the park and crashes over the boulders blocking its path. Explore the full trail profile below for all the details: tips, trail map, and driving directions to the trailhead. 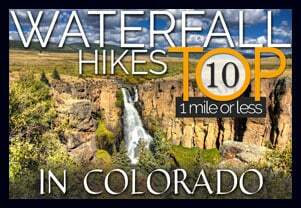 Eldorado Falls can be reached from several different trailheads that tie into the Walker Ranch Loop system. 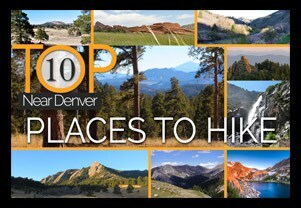 However, the shortest and probably easiest access is by starting at the Ethel Harrold Trailhead. See the directions driving directions links on this page, and be sure to make note of your last couples turns because cell phone services are spotty. 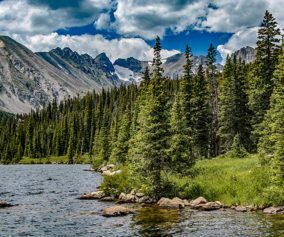 The drive up to the trailhead on Flagstaff Road is a beautiful one, but do be aware of the many hikers, climbers, and cyclists along the road. After Flagstaff road, the two roads that lead to the trailhead, Pika, then Bison, are improved dirt roads. These were recently graded when we visited (early April) and were fine to drive. However, 4-wheel drive is probably necessary during the winter months or after early Spring rains or snowfall. The trailhead parking area has a pit toilet and information board. If you are interested in birdwatching, you’ll find a Birds of Walker Ranch Chechlist at the board. 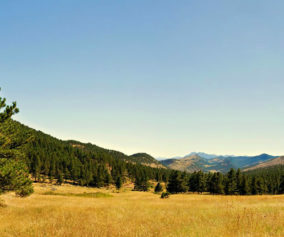 The hike begins with expansive views of Walker Ranch and out towards Eldorado Canyon State Park (pictured above). The air was full of the scent of juniper trees, and we found abundant Elk sign in the meadows near the trailhead. The trail winds down to a intermittent stream that was gushing with the early Spring snowmelt. A bridge buried in snow leads across the creek, then the trail skirts the hillside for most of the hike, gradually working its way down to a junction with the Walker Ranch Loop Trail. 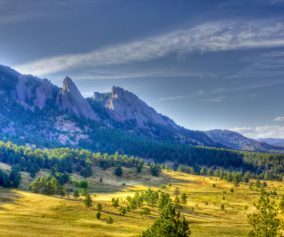 At the junction, the trail to Boulder Creek and Eldorado Falls is to the right and takes hikers further downhill to a bridge that crosses South Boulder Creek. The sound of water is almost always within earshot, and the chirps of a variety of birds fill the air. 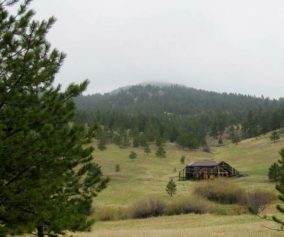 Shortly before the bridge, hikers may notice a “To Eldorado Canyon” sign and trail on the left side of the Walker Ranch Trail. This leads to Eldorado Canyon State Park, about 3.5 miles away, but does not lead to the falls. 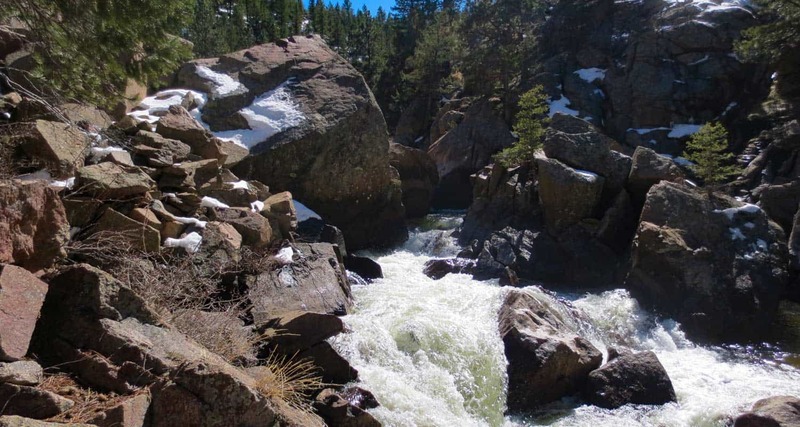 The falls can be found almost immediately after crossing the bridge that spans South Boulder Creek. Here the trail becomes a series of uneven rock stairs that lead to the top of the falls (pictured above is view from the top). “Eldorado Falls” seems to be a local and unofficial name given to this set of cascades. The trail map simply marks them as “falls.” On the back side of the falls, South Boulder Creek seems to disappear under massive boulders that block its path. Here the water slips under the rock then shoots out on the other side in a series of small cascades. The water pools, then pours over another lower falls (pictured above) before returning to calmer waters. The hike back is mostly uphill, but it’s only about a +500′ of elevation gain. The park is open in the winter; however, the trail from the Ethel Harrold trailhead down to the Walker Ranch Loop might become difficult to discern after a blanket of snow. So, the ideal times are Spring through Fall. 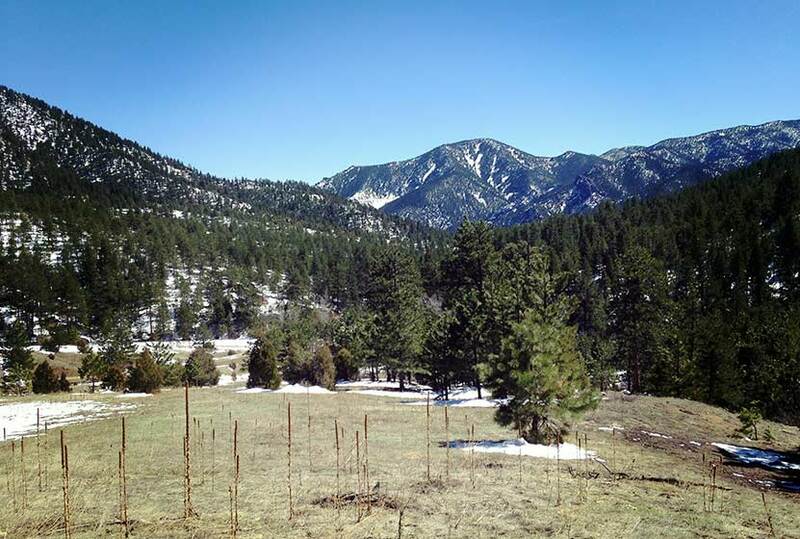 Come Prepared in Spring and Winter: Because the trail is mostly in shade of ponderosa pines, the snow and ice can settle in during both winter and spring. Therefore, we recommend Trekking Poles and/or Traction Devices for this trail (I wish I had brought mine). Exercise Caution Around the Falls: The area around Eldorado Falls is rocky and uneven. The falls is also difficult to photograph because of how it’s tucked back into the canyon. 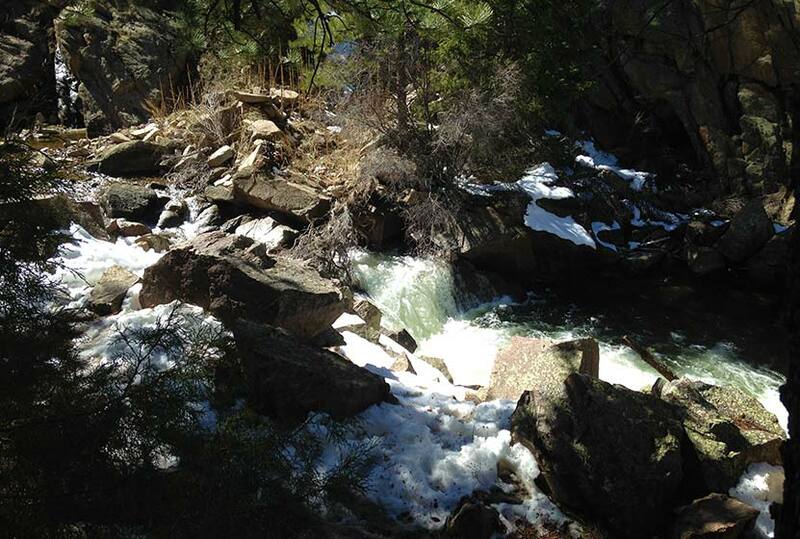 For this reason, exercise caution along the slippery rock and near the waters of South Boulder Creek. It appears they’ve added a new section/route to this trail. Being my first time, I’m not an expert, but the hike is a good bit longer now. So expect about 4 miles round trip instead of 2.5. It does appear that the old trail/fine road is still accessible, but the signage will direct you to the new route. Beautiful hike though and still family friendly.